The first thing you should know about Flaming Geyser is that it is not flaming. It is also not a geyser. In fact, pretty much everything about the namesake of Flaming Geyser State Park is connected to disappointment. It was created inadvertently back in 1911 when coal miner Eugene Lawson drilled a borehole to find coal and penetrated a layer of salt water and methane—this just 11 months after a methane explosion at the nearby Lawson Mine killed 16 miners and wiped the town of Lawson off the map. He returned 11 years later, lit the bubbling mix of water and methane coming from his test hole, and Flaming Geyser was born. Supposedly it shot 25 feet in the air at times, and was at least significant enough to be interesting until someone tried to improve the show with dynamite in the 1960s. After that it burned about 10 inches high, and subsequent earthquakes drained the power further. Now the flame is rarely more than few inches, when it is burning at all. Online reviews of Flaming Geyser State Park are often filled with bitterness. My son Nick and I set out this weekend on a hopeful journey to explore the Green River and its peculiar attraction. Nick came prepared with two survival kits, including food and water, medical supplies, and a knife and flint. You just never know. Along the way we passed by Taylor Mountain, where Ted Bundy deposited so many of his victims (I did not mention this). To Nick it was a beautiful wilderness paradise, even if I saw it through a glass darkly—could almost make out ghosts standing along the roadway hoping for a ride home. We hit three small towns, picked up two moon pies, and at last came to the Green River, where Gary Ridgeway left many of his victims (I did not mention this either). Nick marveled at the beautiful ice along the river bank and jumped fearlessly from rock to slippery rock until I could not help but mention the number of swimmers who drown every year in the Green River. Not to spook him, but the place is clearly cursed. Two stops and a few miles later we turned at last down Flaming Geyser Road and into Flaming Geyser State Park. At the end of the road there was a short trail past a hopeful sign for Flaming Geyser and Bubbling Geyser. We had reached our destination. There was no flame. Just a bubbling hole in a concrete circle in the middle of a pit. But we had not come all this way to be disappointed, so Nick went to the car and returned with the knife and flint from his survival kit. A few scrapes and sparks later he had the geyser flaming in full 2-4 inch glory. Until the wind blew it out. 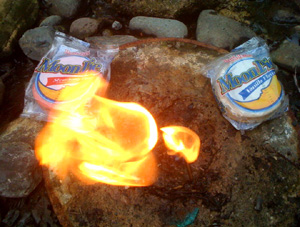 So in the end, it was a pretty good road trip, with one do-it-yourself flaming geyser, two moon pies, and a lot of father-son time. Back in the beautiful Carolinas on business, I take advantage of a sunny Sunday to drive out to Bennett’s Point where the welcome sign features a giant mosquito and the phrase, “Gotta Love It.” Luckily it is early February, and the only thing flying around by the thousands is the white ibis. On Bear Island there is a registration station with a nice map of the area and an alert for possum hunters. Nearby another sign warns, “Hunt Underway.” I opt not to hike around the area because I share many attributes with the possum, like feigning death under pressure, smelling bad, and hissing. So I drive out of Bennett’s Point, and at last, in the distance, I can see a familiar sight for someone from the Pacific Northwest–a black crow disassembling a roadkill squirrel. Except that as I drive closer, the squirrel starts to look less and less like a squirrel, and the crow begins to outgrow any crow I’ve ever seen. I stop the car at the scene, leaning out to photograph the black vulture standing over its dead armadillo. But the vulture is spooked and flies off with an eerie whup whup whup. That was yesterday. Tomorrow is another full day of work, and then it’s off to see the mountains where Doc Watson grew up. 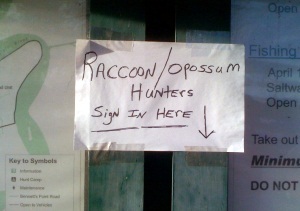 And maybe I can explore them if it’s not raccoon season there.